Victor Kumar woke up one day and realised that his cash flow was far too negative. After swallowing his pride and admitting defeat, he was able to build a much stronger portfolio. 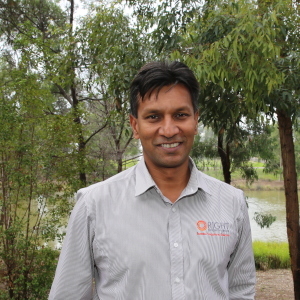 “My wife and I arrived in Australia from Fiji 19 years ago, with just $4,500 to our names. We came in as high-demand employees, as we were both radiographers at the time, and we found jobs pretty much straight away. I was earning $37,000 a year as a radiographer. When we arrived, one of the first questions I asked my brother-in-law, who is a true-blue Aussie, was ‘How do people make money in this country?’. I thought, ‘We’re in a new country; we might as well make something out of it’. He mentioned bricks and mortar. To be honest, I had no clue what that meant, but we had been given an Aussie slang dictionary when we landed so I looked it up and realised he meant houses. We were living in my sister’s garage at the time – we were freezing, as we were used to the Fijian climate – and we kept hearing about people living in their beautiful homes. So I decided to go to the bank and try for a loan. Although we had savings, we were rejected because we didn’t have any credit history with them. This upset me greatly, but I persevered and kept asking ‘How can I get a loan?’. Eventually, one of the real estate agents pointed me in the direction of a broker. The broker got us our first loan, and that got us into our first property. This was a year after we arrived. Instinctively, I gravitated towards a cheaper property – a $137,000 house in a suburb near Campbelltown in NSW. That became the cornerstone of my portfolio. A year after the settlement of my first place, I had an accident at work and got an $8,000 payout. At that stage, I didn’t know much about refinancing and equity, so I used that payout to help buy my first investment property. My first investment was a two-bedroom unit in Campbelltown, which I bought for $70,000. After this we continued to buy and build our portfolio... until one day I woke up to massive negative cash flow. This was mainly due to the fact that in the early years of my portfolio I had purchased brand new, shiny properties. I was focusing on tax deductions, how clean and tidy the properties were and so forth. I’m not a handy person – I don’t know a hammer from a nail. I had a lot of negative cash flow properties. So I sold them down and replaced them with properties in better areas, that had better cash flow and equity. People often try to hide their mistakes and not mention them. Don’t be afraid to admit to a mistake, and don’t be afraid to change tack with a changing market. Often when people are faced with these sorts of scenarios, they don’t know where to turn. I think what you need to do is lean on someone who has already gone through something similar. Lean on someone who is actively investing right now. They will have a pulse in terms of the market, they will know what to do, and they may have connections that can help you out. In the time since my initial investment property purchase, I have changed careers. I turned my passion for property investment into a profession, and am now a buyer’s agent. Initially, I was helping friends and family do exactly what I was doing, finding them properties like mine, because there are only so many that you can buy yourself.